GEOFFREY W. HAWKINS, ESQ., received his Masters of Business Administration and Juris Doctor degrees from Marquette University in 2000. 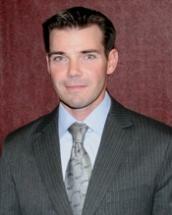 Mr. Hawkins is licensed to practice before all Nevada state and federal courts. Mr. Hawkins was first admitted to the Wisconsin Bar in 2000, and to the Nevada Bar in 2001. Mr. Hawkins is well acknowledged within the legal community. Mr. Hawkins, a Nationally recognized Super Lawyers as a “Rising Star,” is also a legal professor at a national university in the following areas: Business Law, International Business Law, Contemporary Business Law and Employment Law. Mr. Hawkins concentrates his practice on representing business entities in civil litigation, corporate formation and commercial transactions. These areas of practice have given Mr. Hawkins invaluable experience in trials, mediations and arbitrations. Mr. Hawkins’ experience allows for obtaining client goals in a timely, cost efficient and effective manner. Mr. Hawkins believes the client comes first and understands the importance of attorney accessibility and the peace of mind that can be given to clients with timely responses to any inquiry. Mr. Hawkins devotes time to coaching premier level youth soccer teams outside the office. Mr. Hawkins is a professor of legal education at a national university in the following areas: Communications Law and Ethics, Corporate and Social Responsibility, Business Law, International Business Law, Contemporary Business Law and Employment Law.